On Monday the Rossport 5 are scheduled to appear in the High Court for their final sentencing. They could be fined or sent back to prison for refusing to agree to end their protest against Shell's plans to install a dangerous, experimental gas pipeline through their neighbourhood. 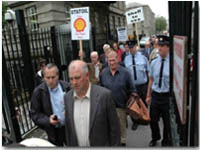 Shell to Sea activists from all over Ireland will gather at the entrance to the Four Courts from 9.30 on. There is always a chance that the court date will be postponed again. To receive up to date information, send your details to dublinshelltosea@gmail.com. If you give us a mobile number we'll text updates to you. The High Court session scheduled for this Monday 27th February has been POSTPONED until March 20th.